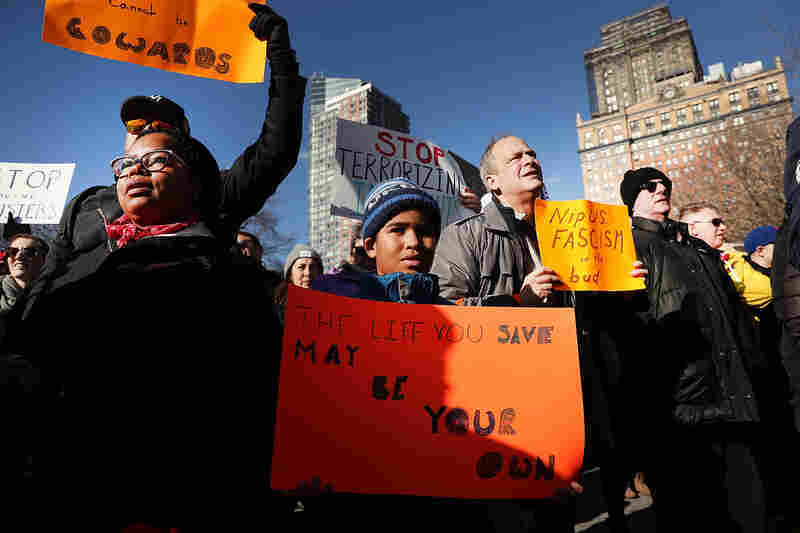 Dispatches Of Discontent: Protesters Of Trump's Ban On Immigration, Refugees Take To The Streets : The Two-Way Demonstrations against President Trump's executive order, which began Saturday outside airports, have now taken to the streets in cities across the U.S. Here's a glimpse of the protests. Tristan Houghton (second from left) joins with other demonstrators as they protest the president's executive order at the Miami International Airport on Sunday. 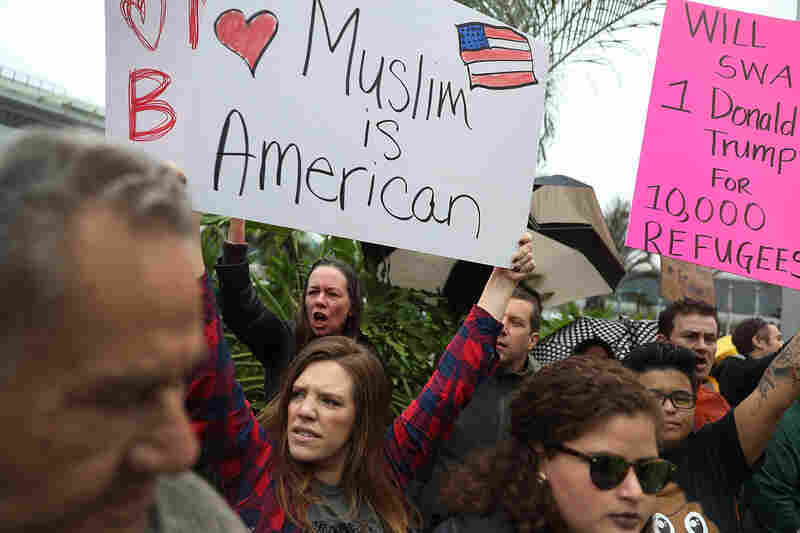 By 1 p.m. Sunday, roughly 300 people had gathered at Sacramento International Airport in northern California to protest Trump's executive order on immigration. 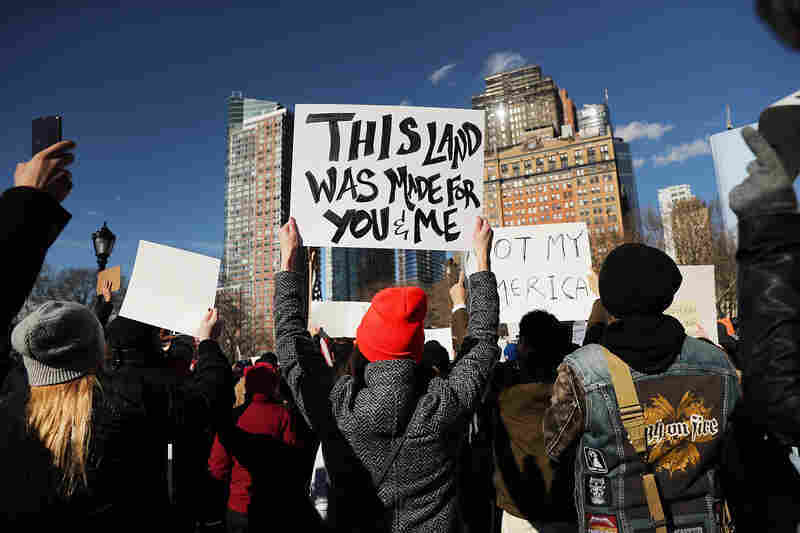 People attend an afternoon rally at Battery Park in New York City to protest President Trump's executive order. 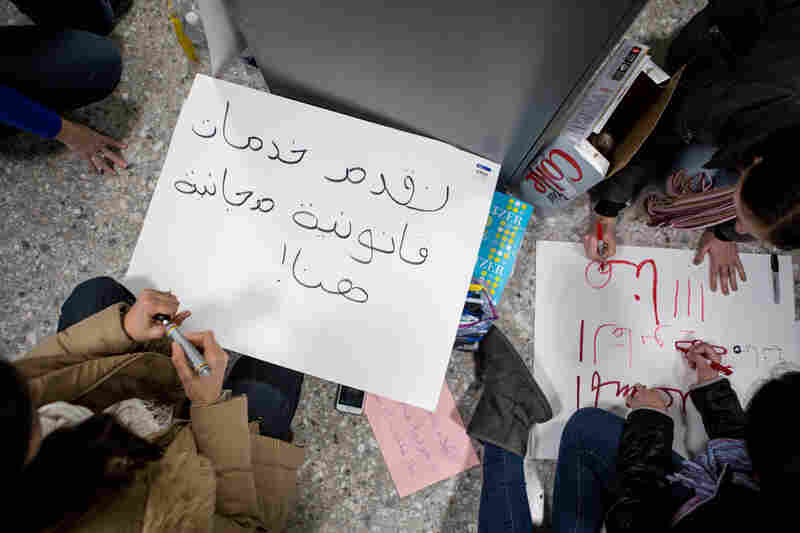 Volunteers pen signs in Arabic with messages indicating "free legal help" available for arrivals at Washington Dulles International Airport in D.C.
A demonstrator takes a photograph during a rally at San Francisco International Airport to protest President Trump's executive order. 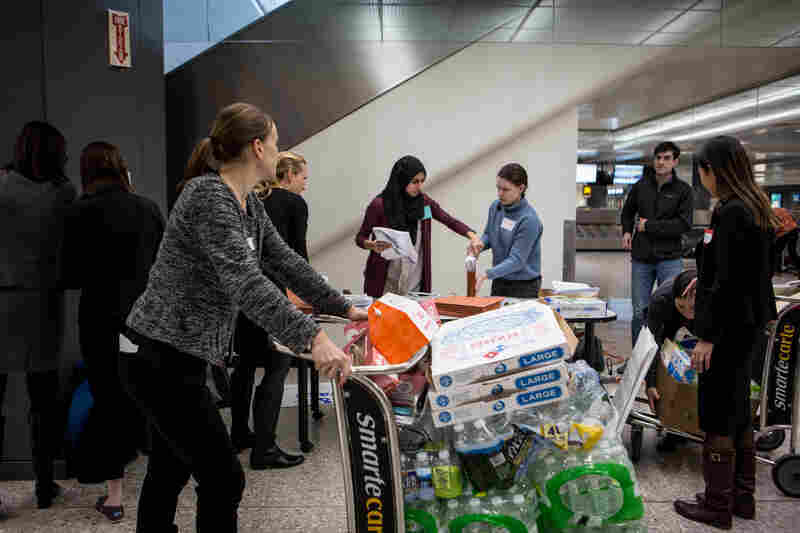 Volunteer attorneys at Washington Dulles International Airport in D.C. set up a temporary workstation near the baggage claim. Salah Alsaidi protests at Battery Park in New York City. His mother is a green card holder from Yemen. 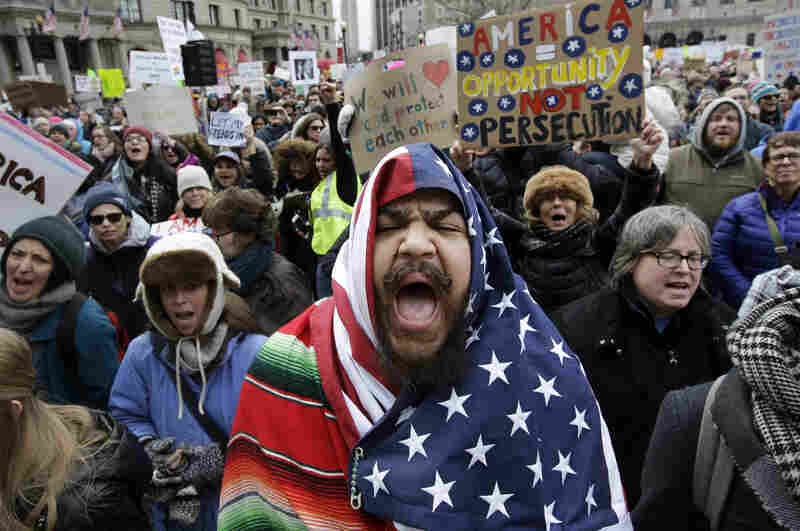 People attend an afternoon rally in New York City's Battery Park to protest President Donald Trump's immigration policies. 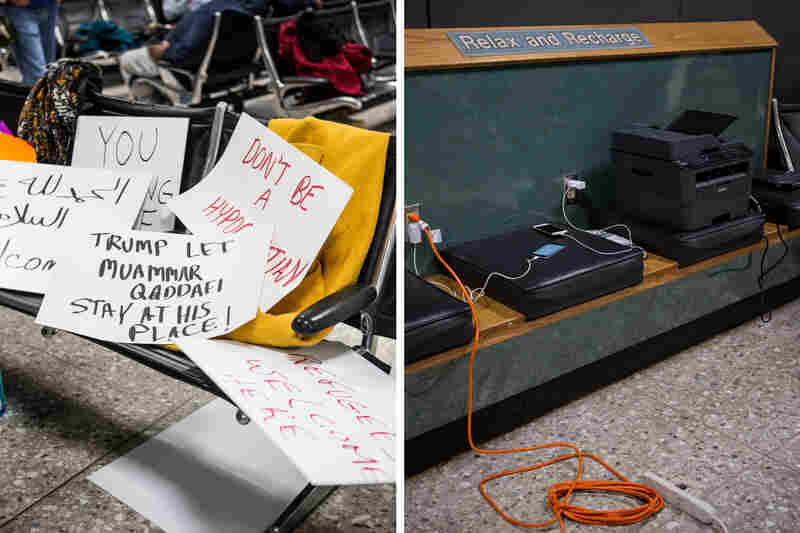 Handmade signs and temporary workstations are sprinkled throughout the international arrivals gate at Washington Dulles International Airport in D.C.
Sacramento Mayor Darrell Steinberg addresses protesters in Terminal B of the Sacramento International Airport in California. 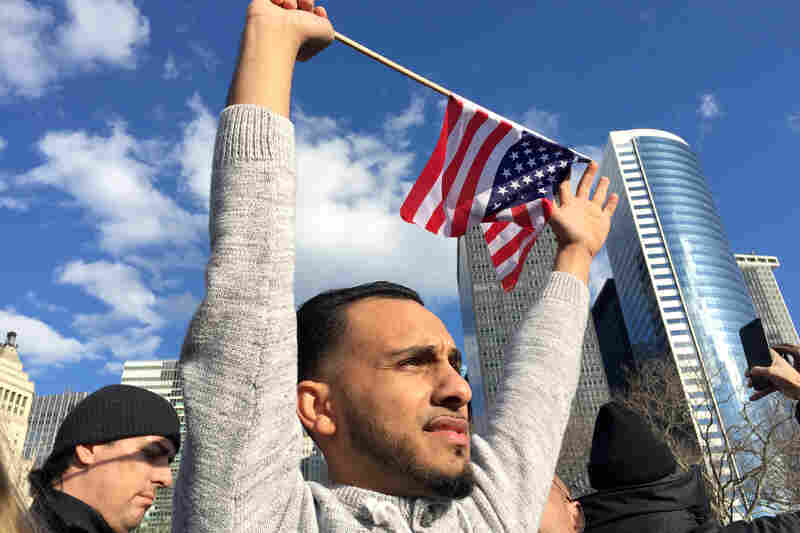 Izzy Berdan (center) wears an American flag as he chants slogans with other demonstrators during a rally in Boston earlier today. 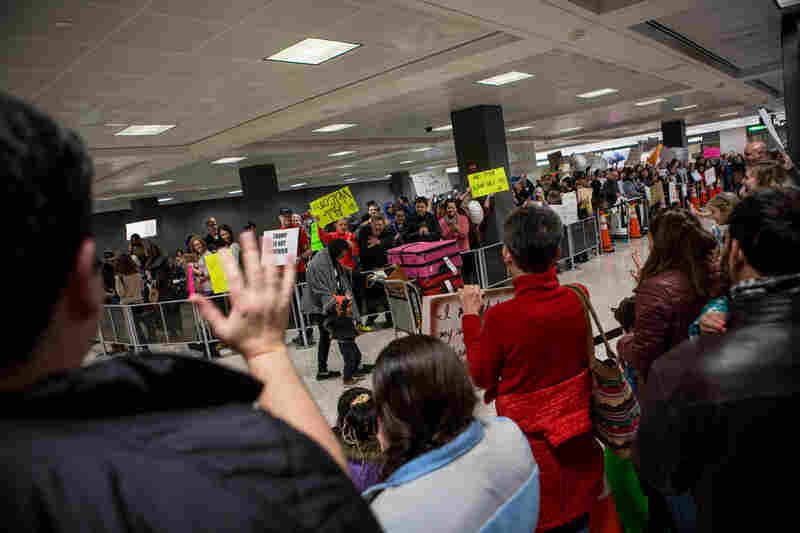 Demonstrators cheer passengers exiting international flights at Washington Dulles International Airport in D.C. 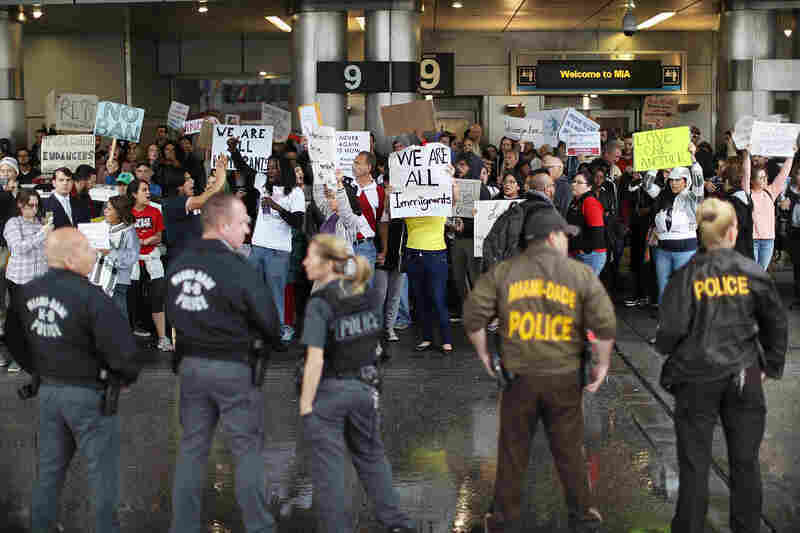 Protesters at the Miami International Airport rally against the president's executive order regarding immigration. That order bars all refugees from entering the U.S. for 120 days, as well as citizens of seven largely Muslim countries for 90 days. The freeze also applies to green card holders, who are legal U.S. residents; they will need a case-by-case waiver to enter the country, which officials say will be granted so long as there is no evidence of the person presenting "a serious threat to public safety and welfare." "Protecting this nation and our people is the No. 1 priority of this president and our government," White House press secretary Sean Spicer said Sunday, arguing that the immigration ban is the best way to do that. Groups of protesters across the country disagree with that assessment — so much so that they make their objections readily evident with signs and chants, rallies and marches in at least a half-dozen different cities. With the help of NPR and member station reporters on the ground, here are some postcards from Sunday's major protests. 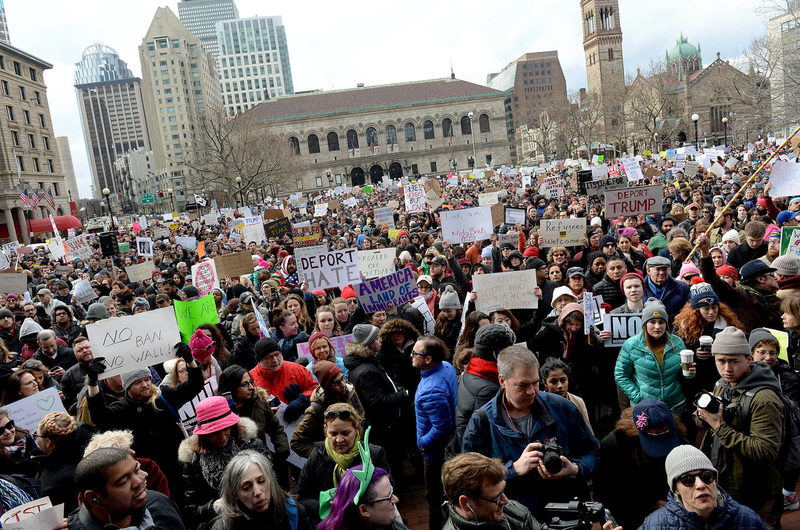 People gather in Boston's Copley Square to protest the immigration ban enacted by President Trump. "A lot of people say they had a visceral reaction when they heard the news either Friday or Saturday," says Jack Lepiarz of member station WBUR. Reporting from Boston's Copley Square, Jack tells NPR's Lulu Garcia-Navarro that the plaza, which is roughly the size of a football field, has been packed with protesters of the executive order. "They say there need to be more protests like this," Jack says, referring to conversations he had with demonstrators there. "It's almost a show of force, as one woman said, where you get the bodies out there and tell the people in office that this is not OK."
Meanwhile, outside the White House, the crowd of protesters rippled with the chant "no hate, no fear, refugees are welcome here," according to NPR's Parth Shah. 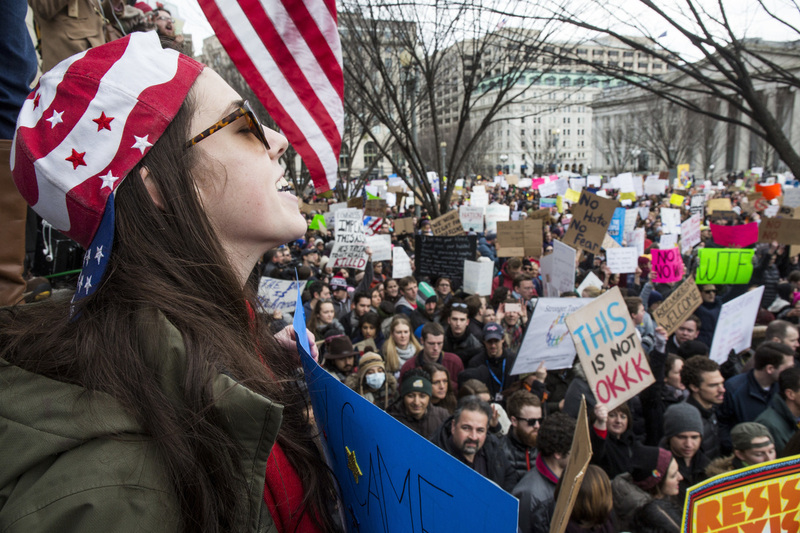 Demonstrators gather near the White House to protest President Trump's temporary immigration freeze on Sunday. NPR's Parth Shah reports the crowd has rippled with the chant "no hate, no fear, refugees are welcome here." "I did not think it would be me; I thought it would be refugees," University of Maryland student Lames al-Kebsi, a protester in D.C., tells NPR's Wynne Davis. "Because I am here as a guest, I am here as a visitor. I am not a threat to the country. It was really a shock ... I didn't expect it to be students, as well." Kebsi, who is from Yemen, says that Saturday night she told her parents that under the order, she cannot see them for the next two years — because if she leaves the country, she will not be able to return to finish her degree at University of Maryland. Others, like D.C. resident and middle school teacher Trisha Sanghavi, echoed the sentiment heard by Jack in Boston. "This is what D.C. is going to look like every weekend now," Sanghavi told NPR. Chris Chester of WAMU reports that what began as a rally outside the White House has now transformed into a march toward the Capitol. Mayor Bill de Blasio was among a slate of speakers — also including Sens. Cory Booker and Chuck Schumer — to address the crowd that packed Battery Park from end to end. "We cannot just luxuriate in our freedoms and our liberties," Booker told the crowd. "We must earn them by fighting to expand them to all citizens and all people." Chuck Schumer made note of his middle name Ellis, a reference to New York's Ellis Island, the famous gateway for immigrants to the U.S. in the early 20th century. Protesters also made the most of their setting in Battery Park, which is the launch point for the ferry to the Statue of Liberty. Many people dressed in variations on the theme of Lady Liberty, bearing fake torches and hats depicting the iconic monument, according to NPR's Kat Chow. 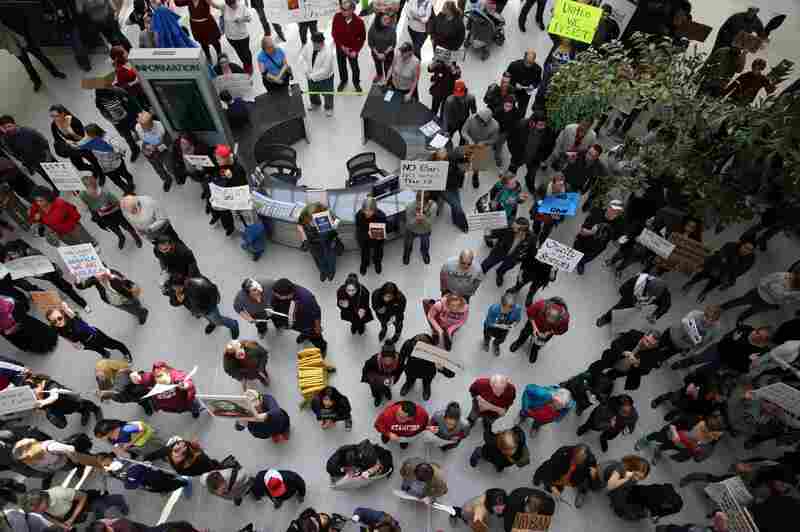 Even as demonstrators have taken to the streets in several cities, protests continue to pack major international airports in the U.S. 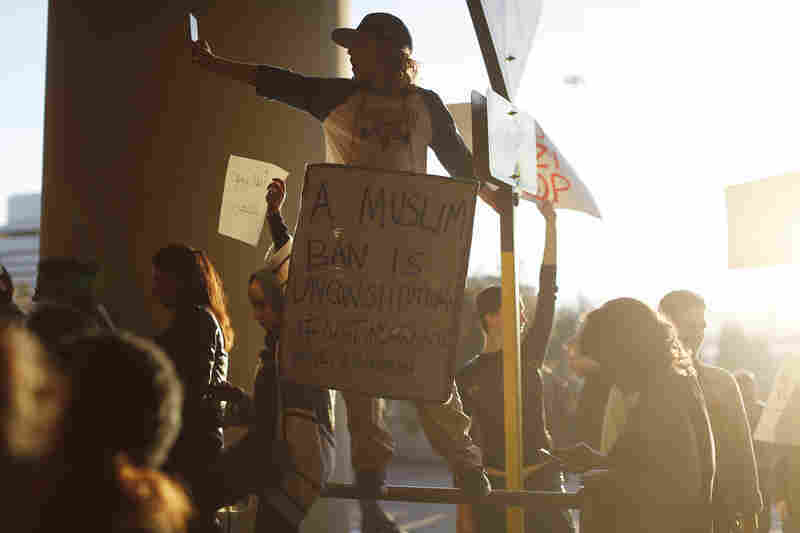 The arrivals hall at Los Angeles International Airport filled not only with signs and loud chants — well before the protest's scheduled start time — but also with a number of lawyers, NPR's Kirk Siegler reports. He notes attorneys scattered throughout the crowd holding signs of their own, only these signs are offering their free legal services for those who could use them. And there may indeed be some who do. Some distressed family members are in the gathering too, Kirk reports. He says it is believed that there are still people detained behind the main gates. By a quirk of coincidence, the protest in Houston was held outside the George R. Brown Convention Center — where festivities were well underway for next week's Super Bowl in the city. Laura Isensee of member station KUHF says it made for a surreal juxtaposition, as football fans in Houston Texans jerseys walked past chanting protesters with signs. She reports that among the crowd were members of a nearby church, just out of a Sunday service, along with members of the Muslim community and Black Lives Matter activists. The protesters numbered more than 1,000, according to the Houston Police Department. Outside the departures area of the city's major airport, as well as inside by the ticketing counters, protesters packed into a peaceful demonstration, reports Kabir Bhatia of WKSU. 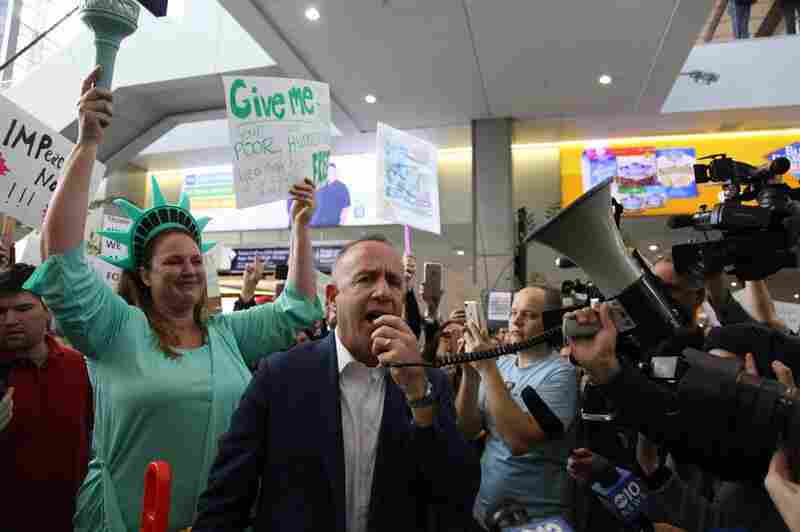 He says the mood of the crowd was almost joyful, as protesters chanted slogans and occasionally "parted the Red Sea" to allow travelers to enter the airport. "I'm just so glad," one girl, a Syrian immigrant, told the crowd with a megaphone. "It just blowed up my heart when I saw everyone's here for the same reason I am." Thousands of people gathered at Hartsfield-Jackson, adding their voices to protesters all over the country, in response to President Donald Trump's immigration order. On Saturday, 11 people with green cards were detained at customs but they were all released. Protester Kathy Taasoobshirazi in Atlanta, G.A. 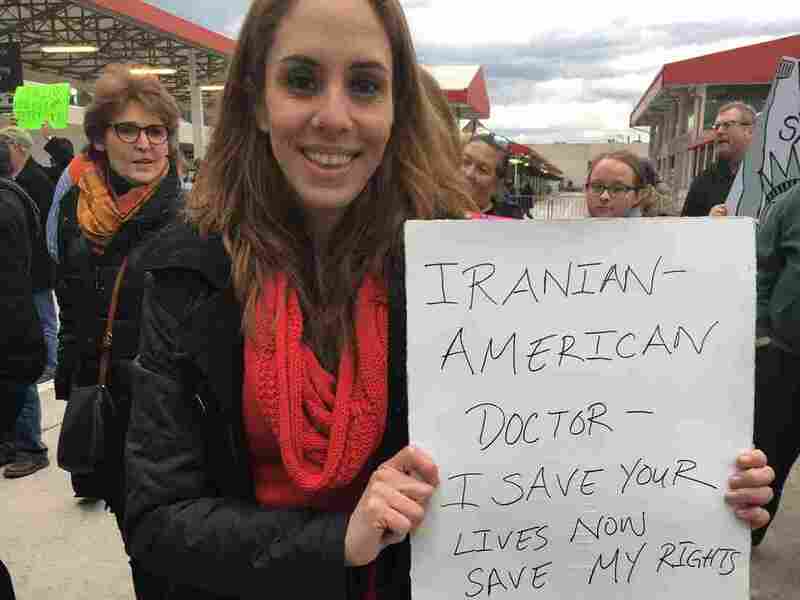 Our WABE member station reporter Molly Samuel spoke with some of protesters, among them, Kathy Taasoobshirazi, a pediatrician whose parents emigrated from Iran. "I just want people to know that Muslim people are not terrorists. Iranian people are not terrorists. We love America, we're proud to be Americans, but we're proud of our culture, too. We deserve the same rights and we are contributing to society," Taasoobshirazi said. Also among the thousands who chanted, cheered, and held up signs on Sunday was Ashley Loftin fromn Decatur who came to the protest with her mom. "We always say come to America, here's the American dream. And by the whims of one person they just changed everything, and I don't think that's fair," Loftin said. Brian Levenson also added his voice, noting it's the first time he's joined a protest. "Usually it feels like either there are enough voices, or there's enough opposition built into our system that I don't really have to worry about it. But, man, I am worried. I am really worried." Congressmen John Lewis and Hank Johnson, Mayor Kasim Reed, and a state senator were among the officials who came to the airport over the course of the weekend.